Over the past half century, Spain’s tourism has risen to become one of the country’s main sources of income, especially thanks to business entrepreneurs like the Torrubia family. 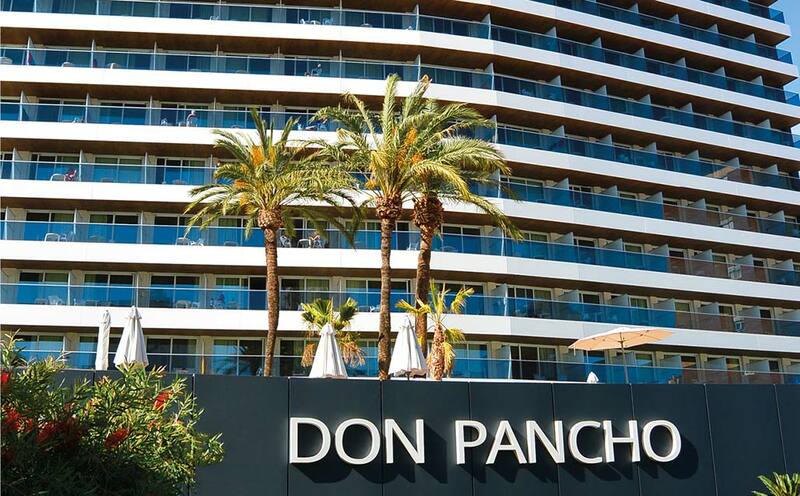 In the early 1970’s, when Benidorm (Alicante) was still just a quaint little fishing village, it was the Torrubias who built one of the first luxury hotels on the Costa Blanca: the Don Pancho Hotel, which now stands as a proud emblem of this vibrant city. The Don Pancho Hotel has managed to keep up its sophisticated reputation by offering exclusive services and upgrading its premises. The latest refurbishment is proof of its constant efforts to provide the best possible quality, and eight of the companies in the PORCELANOSA Group have played their part. "The new façade, made of KRION, is our proudest feature"explains the hotel owner, Alejandro Torrubia. Butech is the Group company that specialises in technical solutions, and was in charge of putting up the façade in the 1100 Snow Whiteshade. KRIONcan also be seen in some of the common areas of the Don Pancho Hotel, the bathrooms, the bar and the buffet, as well as in the rooms on the worktops and shower trays.